Friday Morning Videos: "Two Occasions"
I've never been much into the smooth R&B musical scene (give me funkier stuff by Earth, Wind & Fire or Stevie Wonder any day), but sometimes the whole "quiet storm" groove really grabs me. Anyway, this song did. I heard it only once or twice, when I saw the video in the summer of 1988 on MTV (my parents briefly flirted with cable when I came home from my freshman year). And then I was off on a church mission for two years to South Korea...and weirdly, this song--or whatever I could remember of it, which became less and less as the months went by--just kept gliding around the back of my consciousness. I came back to the U.S., and would occasionally embark on grand efforts to track down the song, but I couldn't remember who sang it, or its title, or hardly any of the lyrics...and besides, I was in Provo, UT, attending Brigham Young University, not exactly a place where folks familiar with Babyface Edmonds's early work were thick on the ground. It was years before I finally stumbled on to this video again. Glad I did. Because that's just the kind of nerd I am. I grew up in a family of boys, all of whom were five-year-olds at one point or another--indeed, I was a five-year-old myself, once. But these days I'm surrounded by girls (and emerging teen-agers), and the consciousness of little boys, and really boys in general, seems to be slipping away from me. Thankfully, AXE COP--a comic book written entirely by a five-year-old boy (though drawn by his older brother)--sets me completely straight. There are nine episodes in all, so far; do read them all. The one with the "half vampire man, half vampire baby, and half vampire kid in the middle" is our favorite. You know, I was actually disappointed when the rapper's flunky started talking at 1:45; I found the video far more effective and persuasive when he was just doing the whole thing in pantomime. So last week I turned to Dead or Alive, presenting it as one of the greatest examples of true flaming goodness. My friend Scott, however, sent me to this website, which suggests that I'd really only just started to scratch the surface. And I guess have to agree. I mean, among other things, how could I have ignored the original? The aforementioned website claims Olivia Newton-John's "Physical" wins the outrageousness contest hands-down. I can't vouch for that, though, because I ran from the room screaming in horror the last time I saw it. I've Not Lost Hope. Yet. I've said before, that I think Obama's approach to political economy just isn't quite populist enough, or socialist enough, or radical enough--that is, perverse as it may seem, just not humble enough (in the sense of being willing to ask the American people to humble themselves enough to profoundly rethink how we build, how we finance, and how we consume in our economy)--to do justice to the situation we find ourselves in. More often, he seemed, on the contrary, quite content to work the corprorate institutions and financial establishments that be, in the hopes to turning them towards more egalitarian ends. Which is hardly a bad thing, of course: as I've also said many times in connection with health care reform, while I'm frustrated with how Obama and the Democrats have moved their reform proposals along, I'd still like to see them turned into law, because bankruptcies could be prevented and lives saved. But that doesn't stop me from continuing to hope that the populist Obama, the class-conscious Obama, the civic republican Obama, will re-appear. Obama sought to combat perceptions that his administration is anti-business and trumpeted the influence corporate leaders have had on his economic policies. Friday Morning Videos: "Brand New Lover"
Sexual ambiguity and general outrageousness abounded on the American dance-pop scene in the mid- to late-80s, of which this video is my favorite. True, it doesn't feature any kind of terribly outre dress or behavior...but it does feature Peter Burns on a horse, for heaven's sake. If you can think of a big video hit that can beat this, I'm open to rival nominations. A long time ago I forwarded this to a bunch of friends of mine for a laugh. Glen, who builds killer robots for the U.S. Navy, commented that whole thing makes perfect sense. "The corn starch is the key, of course." Friday Morning Videos: "Handle With Care"
That was some rough Beatles-related stuff that last couple of weeks. Now, how about a video of the single best Beatles pop song which was neither written nor recorded by the Beatles themselves? Yeah, you know what I'm talking about. The magic of the Traveling Wilburys supergroup didn't outlast Orbison's death, but it did make for one sweet album while it lasted. Sesame Street. 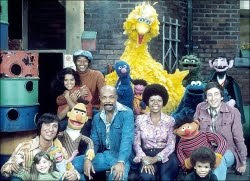 I've talked about my fond memories of old school Sesame Street before; according to family legend, I would watch it two or three times a day (morning, afternoon, and sometimes at lunch) on a couple of different public television station back when I was three and four years old (say 1972 to 1974, or thereabouts). 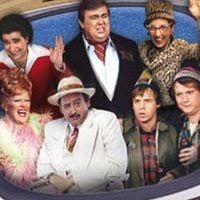 I can still fondly--though vaguely--remember great stories and gags from those years (didn't they once load up the whole gang on a truck and drive to Mexico to help one of Luis's cousins build a house?). As for what I learned from the basic cognitive boot-camp which Sesame Street provided, I have no idea; it's too fundamental, buried too deep. But really, wasn't that the point? Star Trek. The original series, of course; my older brother Daniel and I would watch the reruns of TOS obsessively, on Saturday afternoons. The station in our hometown which broadcast them must not have had a license for the whole set of episodes; either that, or they played favorites. Either way, we saw some of them over and over and over again, until we practically had them memorized. Why did we love the show? Because we were kids, and here was a show we could watch (it's 4pm on a Saturday, Mom, what else should we do?) that showed us adults fighting, dying, loving, solving problems, confronting the void, etc., etc. And then we would run off, play Kirk and Spock and McCoy, and create our own worlds. Science fiction, before I knew what the terms meant, before I'd read anything by that label, gave me a language of story-telling (not to mention of geekery) which I still use today. 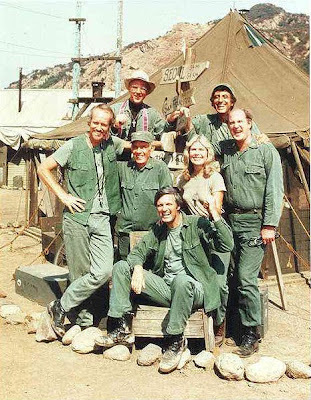 M*A*S*H. In particular, seasons 6 and 7, after the arrival of Winchester and before the departure of Radar. The fact the I even knew that without having to look anything up on Wikipedia is itself the best case I can make for this show: it was he first time I found myself taking a television show seriously as a television show. I read stuff in TV Guide and Reader's Digest about the cast; I would buy copies of People magazine or Newsweek when there were articles about the show or interviews with the stars. Lots of great writing, some awesome laughs, some really affecting (but also sometimes terribly overwrought and melodramatic) drama, but really, overall, the show that gave me an awareness of the mechanics of television drama. 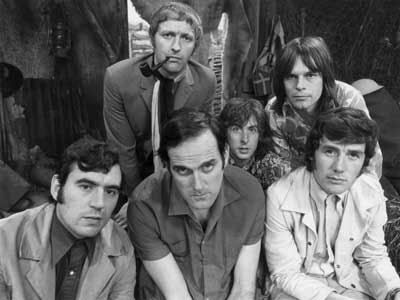 Monty Python's Flying Circus. After SCTV was over, the PBS station would start showing an episode of Flying Circus, and that really blew me away. Dark, lunatic, impossibly intelligent farce, mixed with crude, pointless, cheap slapstick. In dresses, of course. Monty Python has become one of the essential soundtracks to my life, shaping my whole sense of humor and the entire way I mix piety with tactlessness (though not nearly as successfully as they did, through I try). It's a regular feature in my classes; I can't say that about any other television program. Late Night with David Letterman. So by then, after SCTV and Flying Circus, it was 12:30am, and there I was, tired from laughing but not ready to go to bed. What to watch, then, except Late Night (Monday through Thursday, anyway; on Fridays there was no Late Night, but there was Friday Night Videos instead)? My parents had never been fans of the evening talk shows, and so I didn't know what to expect. What I got was yet another kind of irreverence, a silly and thoroughly American kind, one that mixed pop culture and politics together on a daily basis, schooling me--though I didn't realize at the time--in viewing the news of the day as fodder for the mind, something to chew over and crack wise about. I haven't followed and really haven't cared much about the Letterman vs. Leno (vs. Conan and everyone else) battles, but for a couple of years, Letterman framed my imaginary approach to political life as much as the McLaughlin Group or any news show. What some folks get from John Stewart today, I got from Letterman, as the Reagan years came to a close. 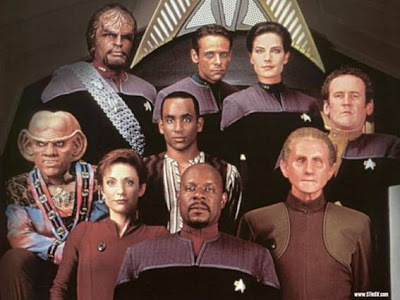 Star Trek: Deep Space Nine. I watched The Next Generation as a student at BYU, and at first I didn't like it--but then, almost no one liked its first couple of seasons. Eventually, though, it began to put out some pretty good episodes, and I, of course, watched regularly. But I didn't obsess over; it didn't dig into me, the way DS9. It's one of the very, very few television programs--maybe the only one, actually--that I watched from it's premier, all the way through to the end, rarely missing even one episode. 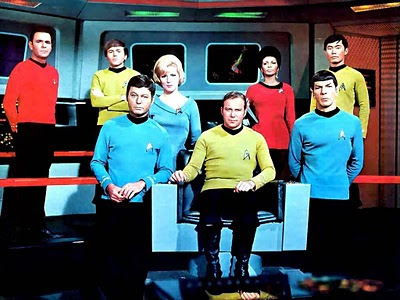 It's also the first television program I became part of a wider community for; sure, as a Star Trek geek, I partook in that fandom universe, but only minimally: mostly, it was all in my head. But for DS9 I was talking to others, reading reviews (posted on the "internet," can you believe it? ), and basically going beyond my interest in the show as a show: I was viewing it as property, something that I was part-owner of, something that I well, cared about. Seems silly to put it so plainly, but it's true: the show completely fell apart in its last two seasons, especially the final one, and it pissed me off. We were living in Germany the summer of 1999, after DS9 had wrapped up its final episodes, and as I'd missed them (I went over to Germany in early May), Melissa had taped them all for me, and brought them with her. I stayed up late one night, watching the final episodes back to back, and I found myself getting angry, actually stomping around our apartment, arguing with the television set. I'd never done that with a tv show before, and I haven't since. Northern Exposure. Melissa and I were married and living cheap the year after we'd graduate from BYU, waiting to find which--if any--graduate school I'd go to. All we had for entertainment was our television set, with no cable, and a limited number of stations. 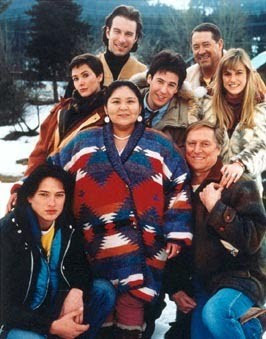 So we watched a lot of TV--and we discovered Northern Exposure. It was already winding down by then, to a not particularly enjoyable conclusion, but we watched it together, and faithfully recorded late-night reruns, delighting in the show's whimsical mix of music, character, scenery, mood, and story. We ate it up, and still sometimes share moments of the show with each other in jokes or memories. It was show for us. Homicide: Life on the Street. 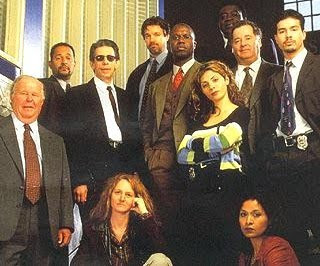 The other, much less romantic and funny, much more dark and disturbing, tv show we watched together was Homicide. I'd read a couple of iffy reviews at some time in the past, and avoided it for a few years. But then something--I remember; it was the episode where Robin Williams guest-starred--made me tune it in, and I was hooked. Slowly, but surely, I dragged Melissa in, and it became a show that we argued about. It was the first show either of us had ever followed which provided such detailed, sometimes convoluted, sprawling story-lines; I'd become invested in characters and the world they inhabit before, but never so much in the writing, in the twists and turns of plot and the rotating in and out of characters new and old. It introduced me to a knew way of relating to television story-telling. The fact that Melissa and I became, for a few years, passionate Law and Order--during the years with the classic Jerry Orbach/Chris Noth line-up, years during which L&O and Homicide crossed-over a few times--only made it more complicated, and more worth watching. The Adventures of Sherlock Holmes. Since the kids started arriving, I've watched less and less television. That goes for both of us; I think we've actually been without television reception for most of the past decade or so, and we don't miss it much. The tv set sits there, used for movies, and that's about it. Except, of course, that over the past several years, we've discovered television on dvd. 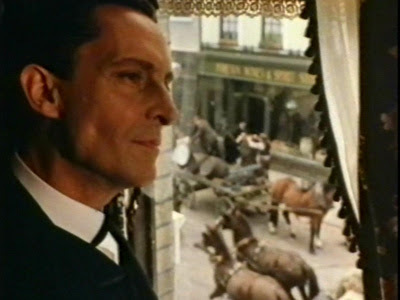 The first real breakthrough here came with getting the superb, Jeremy Brett-starring, BBC-produced Sherlock Holmes stories: all six series of them (though the final one, The Memoirs of Sherlock Holmes, when Brett was very ill, is unfortunately of poor quality). The programs themselves are excellent, but what was most changing is that it made me realize what I'd been missing through the 90s and the decade since, as complicated, long-form, interconnected television shows were made and broadcast, simply begging for dvd treatment. Through Sherlock Holmes my eyes were opened to so much good television; Rome stands out in particular, but also Monk and, lately, Life on Mars. Given our aforementioned affection for Homicide, I suppose one of these days we'll make our way through The Wire, and Melissa is right now delighting our girls with Robin Hood (I watched the first season, but took a pass on the rest.) But Sherlock Holmes will stand out as my real introduction to this format...and, of course, also because it was, as everyone agrees, one of the finest examples of television casting and acting in history. Ok, so there you go: the ten most important television shows in my personal history. What are yours? It's already making the rounds, but I simply can't resist. I want to move to California and register as a Republican solely so I can vote in this election. An ad like this deserves our support. ABC and its owner, Disney, sort of see Lost as a much bigger property. I think they see it as a long-term franchise--not unlike, say, Star Wars or Star Trek--that can live on for 20 or 30 years. Now, I've never been much of an enthusiast for the Star Wars universe; saw the original film lots when I was a kid, but even by Return of the Jedi I was sitting in the theater, thinking the movie wasn't very good. Star Trek, of course, is a different issue; that's a franchise I can get at least somewhat passionate about. So I can appreciate how television shows can expand, both from their original premises and within the imagination of their fans, so as to go on seemingly forever, following their characters and foibles and adventures for as long as there is someone to write them (and a corporate entity willing to license such). But still...Lost? I suppose I could hang out on Wikipedia and try to dope out the whole mythos, but I'd rather turn to knowledgeable others to just give me the essentials. And the key essential is...um, how? Granted, I've seen exactly one episode of Lost in my life (everybody was talking about the first season, so I tuned into the first episode of the second, back in 2005, and watched a couple of guys go down into some deep bunker where they discovered this lunatic watching them with camera and hitting a button to prevent the island from blowing up, and then there was this old film they watched which talked about crazy experiments from the 1970s...am I making any sense here? ), so what do I know? But still...aren't they on, like, an island? Doesn't that kind of limit the whole "strange new worlds" element of any possible franchise? How would they get new characters? Would random planes just keep crashing on the island every few years, or what?